Richard Rojas, who ploughed into people on a Times Square sidewalk, returned from his Navy service with a drinking problem and had posted 'crazy stuff' on social media. US Navy veteran Richard Rojas is arrested for driving a vehicle that struck pedestrians in New York City. New York: Richard Rojas, 26, plowed into people on the sidewalk in his burgundy Honda sedan and sped three blocks through one of the city's busiest areas, killing one pedestrian and injuring 22 before crashing into a metal stanchion, police said. Rojas returned from his Navy service with a drinking problem and had posted "crazy stuff" on social media, said a friend, Harrison Ramos, speaking to Reuters outside the apartment building where Rojas lives in New York City's Bronx borough. "Don't make him out to be a terrorist or something," Ramos said. "He served his country and when he came back, nobody helped him." Rojas attended college and works in real estate, Ramos said. "He went through a real tough time," Ramos said, adding that he had lost contact with Rojas. "That's my friend. I care about him, and it hurts." Only a week ago, Rojas was arrested at his apartment in the Bronx for threatening another man with a knife. "Do you feel safe? You stole my identity," Rojas told the man, grabbing his neck in one hand while brandishing the knife in the other, according to a police spokeswoman. She did not have additional details. He was charged with menacing and possession of a weapon, according to court records. He pleaded guilty to harassment, a violation, and was not sentenced to any prison time. Rojas was also charged with drunken driving in 2008 and 2015, according to New York City police. The state motor vehicle department confirmed he was convicted of driving while impaired in both cases but still had a valid driver's license as of Thursday. 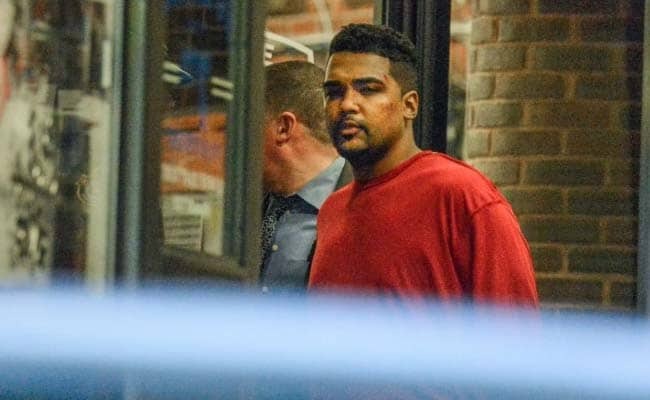 In the Times Square incident, Rojas was charged with one count of murder in the second degree, aggravated vehicular homicide and multiple counts of attempted murder, a New York police spokesman said in an email late on Thursday. He was expected to appear in court on Friday at an arraignment hearing. It was not immediately clear whether Rojas had a defense lawyer. Rojas enlisted in the Navy in 2011. He served as an electrician's mate fireman apprentice, mostly based in Florida. While stationed in Jacksonville, Rojas was arrested for battery and resisting an officer without violence, both misdemeanors. An arrest report from the Jacksonville Sheriff's Office said Rojas yelled at an officer, "My life is over," and threatened to kill police after his release from jail. He also told the officer that he had beaten a cab driver to whom he owed money and had been drinking at the time of the arrest, according to the report. Court records indicate the charges may have been dropped. Navy records show he spent two months in a military prison in Charleston, South Carolina, in the summer of 2013 but do not specify why. He left the service in May 2014, according to records, which do not offer any additional details. A few hours after the Times Square incident, about 20 police officers and detectives occupied the sidewalk outside the six-story red brick building where Rojas lives. A woman who used to live in the building, Fati Razak, said she occasionally sees Rojas when she returns to visit her mother. "We don't have anything in common except to say 'hi,'" said Razak, who works as a hairdresser next door. She said Rojas' family is Dominican and that his mother is a "sweetheart" who sometimes makes food or coffee for the beauty salon's workers.